^ Total dividend amount declared for financial year ended 2019-06-30. KUALA LUMPUR (May 25): AWC Bhd's net profit rose 10 times to RM5.76 million or 2.25 sen per share for its third financial quarter ended March 31, 2016 (3QFY16), from RM575,000 or 0.26 sen per share a year ago, driven by stronger performance across all its business segments. Revenue surged 143% to RM75.33 million in 3QFY16, from RM30.99 million in 3QFY15. The engineering services provider also declared a special dividend of 1.5 sen per share for the financial year ending June 30, 2016 (FY16), payable on July 1. In a statement today, AWC said the facilities division reported increases in revenue and earnings for both the current quarter and on a year-to-date (YTD) basis, brought about by new contracts secured and implemented throughout the year, most notably from the Hospital Shah Alam Selangor contract, Menara Felda contract and the rate revision in maintenance work undertaken for the renewed concession. Its environment division also saw a huge leap in revenue for both the current quarter and on a YTD basis, due to good progress billings from on-going projects and the delivery and installation of big ticket items throughout Malaysia, Singapore and the Middle East. The engineering division also delivered good results as current quarter and YTD revenue and earnings were boosted by strong sales in Singapore, and contributions from the newly-acquired plumbing subsidiaries, AWC added. For the cumulative nine months period (9MFY16), the group's net profit almost doubled to RM10.76 million or 4.38 sen per share, from RM5.59 million or 2.48 sen per share in 9MFY15; while revenue increased 84.5% to RM173.34 million, from RM93.96 million. “This quarter’s revenue of RM75 million is our best yet, and our cumulative three quarters revenue of RM173 million and net profit of RM10.76 million substantially surpasses FY15’s full year results (where it recorded a net profit of RM7.78 million)," AWC managing director and group chief executive officer Datuk Ahmad Kabeer Mohamed Nagoor said in a statement today. "We now look forward to our final quarter results and will continue to work tirelessly to create value for our shareholders,” he added. AWC has formed a breakout-pullback-continuation pattern to close above the EMA120 level with rising volumes. The MACD Histogram has extended another green bar, while the RSI remains above 50. Price may trend higher towards the RM0.82-RM0.865 levels. 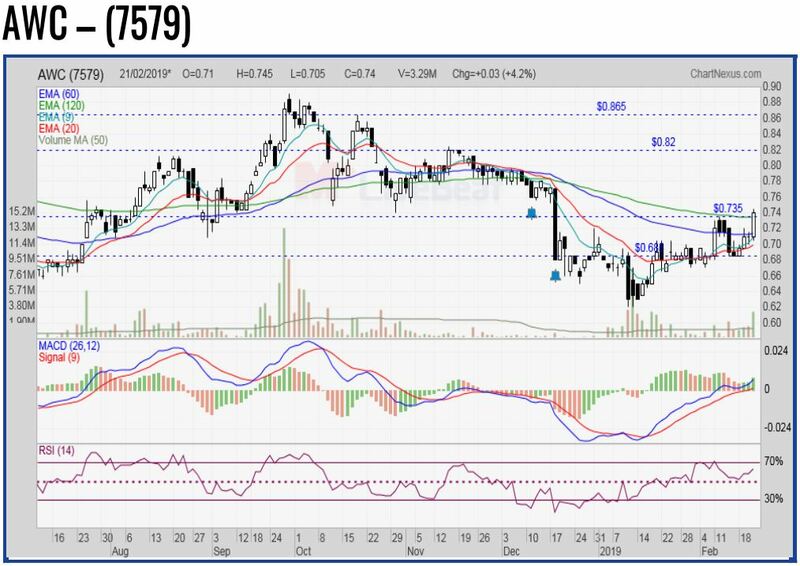 Support will be anchored around the RM0.685 level. Prapat and 11 others like this company.